I love cross-country. The courses, the mud, the support, the rivalry. 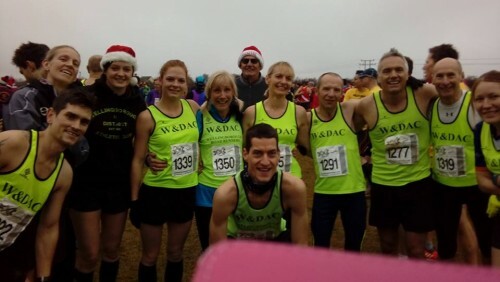 One of the benefits of membership with my running club is that each year you get free entry into all of the Three Counties Cross-Country races, of which there are five. When I first posted a picture of Oscar announcing his arrival on my running club Facebook page back in September, I vowed to return to running in time to make the end of cross-country season. With two races still left in the 2016-17 series I returned for the fourth event this past Sunday. The last race before Christmas always has a fantastic atmosphere. Runners are adorned in Santa hats and tinsel and there are even musicians out on the course playing festive songs. I loved the addition this year of hanging foil Christmas decorations between stakes instead of red and white tape too! There was also something happening with baubles out marking the course – although I almost stepped on one thinking it was a mushroom! 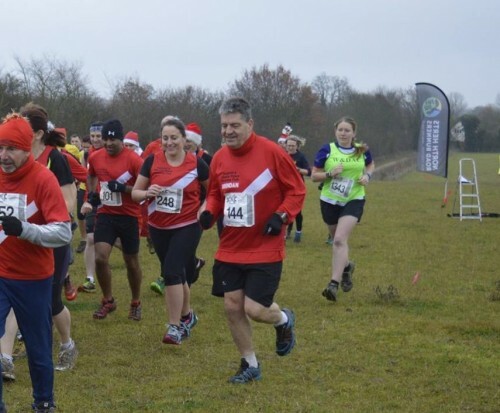 Having run the course before (2014 / 2015) I knew that Letchworth cross-country, hosted by North Herts Road Runners, was a fairly straight forward one. There were two long hills, but hills which only had a small incline. The weather hasn’t been too wet lately, so mud would not really be an issue either. I started off right at the back – although there was a bit of a confusion over which direction the back was…we ran the other way round the field last year! I would prefer to be overtaking other runners rather than constantly be overtaken myself and it was nice to pass several runners out in the field early on. When I first began I kept another Wellingborough runner in sight who tended to finish in similar positions to me before I became pregnant. I had no intentions of pushing myself hard whilst out on the course, but I had no idea how well I would be able to pace things either, so thought it would be best to keep a marker in sight to focus on. Despite having planned to clean my trail shoes on the Saturday night, I ended up too tired and it never happened. There was no point in attempting to clean them when I woke up on Sunday morning as I would just have ended up with soggy feet, so I pulled out a pair of old trail shoes from a couple of years ago. So trusted and worn that the fabric across the bridge of my feet is completely destroyed. They felt incredibly heavy compared to the road shoes I’ve been sporting recently and it was a real effort to lift my feet without feeling weighed down, but the tread is still very good and I could still trust them not to slip on any of the slightly slippier trail out on the course. The course is almost an out-and-back course, although at the far end the route loops round a couple of fields before returning on the same track that the runners headed out on. I love it when races have a portion of the race where I am able to cheer in our front runners on their way back towards the finish line. So often they cheer me over the line but as a slower runner I find myself missing being able to support them on so many occasions. I managed to cheer our first four club runners up the hill here before my attention was caught by the brass player belting out a version of ‘Jingle Bells’ on my left. As slower runners we all automatically moved over to the left of the path so that the quicker runners may pass us in the other direction. The track was filled with large puddles, with an easy way through along the centre of the path where the quicker runners now ran. Along the side was much harder to balance, with slanted sides sloping down to the puddles underneath! There were a couple of minor variations to the course this year, such as traveling along the left side of a hedge instead of the right or similar. But essentially, the course was the same as it had been the previous year. After months of not wearing my heart rate monitor during my pregnancy, I’d forgotten to put it on that morning. Because I didn’t want to get carried away and caught up with the crowd I decided from the beginning that I would take a walking break at any point I found myself pushing. I took two of these short walking breaks whilst out on the course – just for a handful of strides at a time and no-one overtook me to stay in front at these points. There is a short, sharp drop near the beginning of the race where runners drop down onto a single file track. It was not possible to overtake along this section but because cross-country is about position rather than time, I enjoyed the steadier pace, pushing past those in front of me as the track opened out again a little further up. Pushing up the steep slope at 5 miles was tough, but as runners were really spaced out it was easy to get a good run-up at the bank. I really surprised myself when the Wellingborough runner marker I had chosen at the start of the race finished still in eyesight, and only five places ahead of me. The runners finishing around me were those who would do normally, when I was at pre-pregnancy fitness. Perhaps I did strengthen my body more than I first thought when I continued to run over the Summer. Choice of rolls at the finish included ham and mustard, turkey and cranberry or salmon and dill, with a selection of Christmas themed or decorated cakes and mince pies for dessert! Have you been to any cross-country events this season? School cross-country – love it or hate it?! Live to run or run to live? Well done, what a brilliant (and sensible) approach and finish. I always like the sound of these- Letchworth isn’t too far away for me- maybe next year I will try and persuade my club to join in. I love the sound of mince pies at the end- even though I’m not a huge pie fan (I prefer the filling) having one after a race sounds really good. I did not like cross country at school- I walked most of it at the back as I found it very hard- but then we were never taught any techniques, or told to run/walk or anything, and so after trying to keep up with everyone for 100m or so, it was just too tough. If I knew then what I know now I am sure I would have enjoyed it much more- I loved playing hockey in the winter and that was running about getting muddy. Oh yes, it would be great if you joined in. It’s a fab atmosphere. I agree – we weren’t really told about any cross-country techniques at school, and if we had been, I think it would have made a difference. School cross country was a once-attempted farce. We ran round those bits of the school grounds which were normally out of bounds (it was, thinking about it, quite a nice course. Flat. Some mud), while wearing our normal plimsolls (so a pair of Green Flash in my case). The fast, fit types laughed at those of us who would be told to ‘run faster’ (I was running at top speed when I had a PE Teacher yell that at me. Gave me a complex for years). It was something of a disaster area, and I didn’t even bother trying after the first few hundred yards. 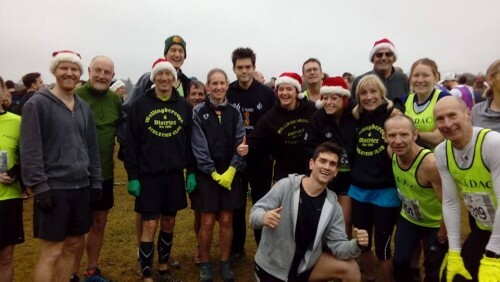 Rather looking forward to Box Hill Knacker Cracker on Sunday…. I remember running outside in plimsolls! Whoever thought that was a good idea?! PE teachers are the worst at having ‘favourites’ I always think. At least it didn’t put you off running for good.